Simple Seal Kitchen And Bath Easy-To-Use Home Sealant 9 oz. Dynaflex 230 Sealant – Clear 10 oz. Caulk Be Gone – Green Gel 5.5 oz. 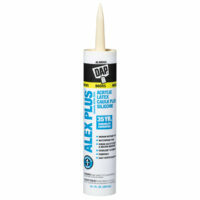 DAP Alex Plus Acrylic Latex Caulk Plus Silicone – Almond 10 oz. DAP Sealant – Grey 10.3 oz.